Kohaku hummed, noticing the way Drina spoke. "Are you pouting because I teased you earlier," she asked calmly, concern melting her insides. She didn't like making people unhappy, and Drina was barely talking now since Kohaku hadn't given her what she wanted immediately. "I'm sorry," she murmured, her hand around Drina's waist using her fingers to trace invisible patterns along the slope of Drina's back, hoping this calmed the other woman; after all, this is what she knew what to do, or what she expected she had to do. The younger of the two pecked Drina's temple affectionately, hoping the other wouldn't get mad. Pouting...? "Teased me?" Drina was actually rather confused. First of all she wasn't pouting, and when had Kohaku teased her? Slowly she lifted her face some to glance up at the woman's face. Kohaku seemed genuinely concerned about it. She didn't say anything more but nuzzled against Kohaku a moment before shifting slightly so that her arm laid across Kohaku's chest so that her hand rested on the shoulder farthest away from her; the side of her face laying gently against the other shoulder. The touch against her skin was rather soothing really, that is until Kohaku's fingers brushed against Drina's tail bone. As soon as the tips touched there she shuddered slightly and let out a small noise before she quickly moved her hands to cover her mouth as she blushed a deep shade of red. "Ye--" Kohaku paused whenever Drina nuzzled against her. She figured she was forgiven, or that's what she assumed. So, with a calm expression, Kohaku held Drina a bit tighter, her mouth pressing into a right line. She was thinking so much lately, she had to stop for now. So, she started to observe the other woman, smiling at the way she curled so securely to the blond. It was actually rather cute. What she found cuter was the sudden noise Drina made, and how she quickly his her face. Kohaku didn't know why she did such a thing, by it made Kohaku coo a soft "awe". The fingers tracing low on the dip of Drina's back swirled a few times, figuring that it was along her calmer. "What's up with that face, Drina," she asked, tone light. Drina shifted against Kohaku slightly; her hand gripping tightly at Kohaku's shoulder. Each time Kohaku's fingers brushed against or too close to her tail bone Drina let out noises that grew closer an closer to sounding like a light moan. "S-stop it!" Her face was probably as red as it could get at this point. "W-watch where you're touching me, Kohaku! I'm sensitive there..." She actually whined slightly. Kohaku was still curious as to what was making Drina so vocal. It was a change in personality, that was for sure, and with the noises becoming more frequent, she found herself lost. "Stop? What--" Kohaku realized the onl limb really touching Drina was her hand, to which was tracing along Drina's lower back. She instantly flushed in embarrassment and let the hand fall to the mattress, immediately feeling bad. "I'm really sorry about that; I didn't realize--" as she began to explain her excuse, she became flustered and shut herself up, looking away. She cannot believe she was so close to a sensitive area, Drina's backside no less!--and made Drina uncomfortable. Well, now she knew not to touch there. Drina felt like she could actually blush a bit more when Kohaku's hand moved away and she realized what Kohaku assumed was the problem. "N-n-no, no! It's not what you think..." She glanced away some and bit her lip slightly before slowly pushing herself up some so that she could look down on Kohaku's face. "Your hand...It was brushing at my tail bone...It's where my tail's hidden...It's not like you were going any further." She averted her eyes slightly once more. "I-it's just really sensitive..."
"Not what I think?" Oh this was a train wreck. Kohaku's blushed deepened considerably. "But, um, eh-what--" she was cut off by Drina's movements, and now she was staring above herself, eyes large with awe as she listened to Drina speak, completely forgetting her embarrassment from earlier. "Wait, tail?" She became quickly facsinated. "Can I see? How does that work? I didn't know you were part fox! I guess that explains the furs," she chatted to Drina, looking rather excited and curious. She'd never seen someone with animal parts before. That must be also why Drina had a good fox face! A light blush crossed over Drina's face once more as Kohaku questioned her and such. She glanced away some. "My clan...Has had a contract with the desert foxes for a long time, and I guess over that time they sort of...Merged a bit?" See it...? Drina bit her lip slightly as if she were in thought before she took a deep breath and closed her eyes. Fox ears as black as her hair slowly poked their way out of her hair and stood up straight as her tail slowly made its way out as well. Surprisingly enough it didn't match her hair or ears though; it was more of a white or cream color. Opening her eyes back up they were a golden color and she flushed slightly again before glancing away. "Wow, really? That's kinda cool," she gasped in awe. Her eyes focused on Drin/ face, but flicked up quickly to watch as Drina's ears formed at the top of her head, looking so fluffy and adorable. 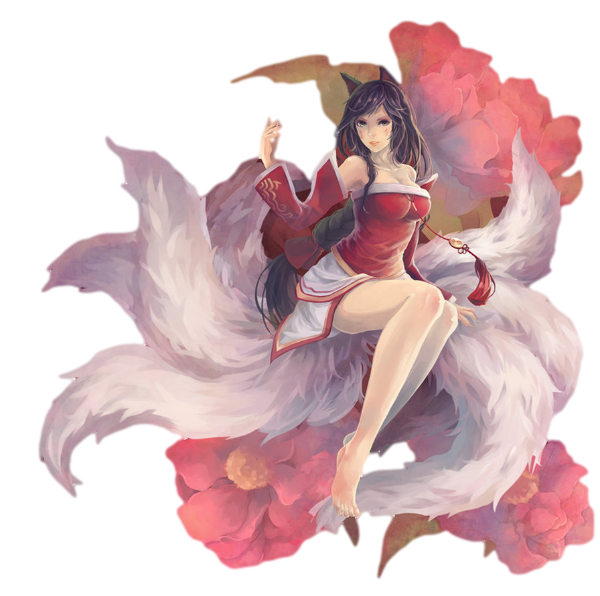 Recalling she also had a tail, Kohaku adjusted herself so she could see, and made an astonished sound whenever her backside was now formed with fox-features as well. Kohaku hesitantly reached for an ear, but then paused. "Um... Drina?" She sounded shy, almost embarrassingly so. "Can I ... Is it okay if I touch your ears? They just look so adorable," she murmured, fingers twitching slightly. Drina blinked slightly when she noticed that Kohaku was checking out her bare backside which earned quite a blush from her. It hadn't been a problem until her tail was out, but now for some reason it made her somewhat embarrassed to have Kohaku looking at her like that. Her ear twitched back and laid against her head as Kohaku's hand reached towards it, but at the question she bit her lip once more before slowly straightening her ear out. "J-just be careful..." She'd never had anyone touch her ears in such a way before; heck she didn't even know just how sensitive her tail area was until Kohaku had brushed her fingers against it. "Are you sure," she asked with disbelief, for she could not believe he was being allowed to touch an actual fox ear on a person! The excitement was clear on her face as she reached once again, her fingers being delicate as she brushed them along the edge, finding it extremely soft. Still being quite careful, Kohaku stroked along the backside of an ear, loving the way it felt between her fingers. Soft as a feather, if not more so. "Wow, they're really amazing," she breathed, tracing along the outside edge before gently rubbing the tip of Drina's ear. Drina flinched slightly and her ear twitched against Kohaku's hand as it ran against the edge and then the back. It was an odd, but good feeling that was certain. Slowly her eyes fell shut and her head tilted slightly as Kohaku started to rub the tip of her ear. Slowly and carefully she laid on top of Kohaku; paying extra attention to the wound on her stomach so she wouldn't cause any pain to it. Her cheek pressed gently against Kohaku's chest as he settled in against the woman, not saying a wordin response. Kohaku was rather enjoyin herself, skewing each digit along the furry base and scratching towards the top, as if she would to a typical house cat. Her cheeks were highlighted with a blush, for the small twitching ears were just too adorable to resist! The blond allowed Drina to lay upon her, noticing how she was careful to avoids Kohaku's injury. This made her feel happy that the other was mindful of injuries. So with little to voice, Kohaku kept silent, petting the ears as she thought of Drina's tail. She figured she couldn't touch the tail, especially since just stroking the skin around the area made the dark-haired girl whimper like that, the blond sighed happily, using her free hand to card her fingers through Drina's hair. Drina's eyes had opened up once more and she stared at the wall as she felt Kohaku's fingers scratch gently over her ears and then her other hand started running through her hair. Slowly she opened her mouth and let out a large yawn; a few tears gathering at the corner of her eyes before she finally closed the and relaxed more against Kohaku before falling asleep from the touch. Kohaku didn't noticed how tired Drina was getting, due to the enchantment put upon her by the appendages presented to her on top of the dark-haired woman's head. She thought about asking Drina why her tail was a different color from the pair of ears. However, whenever she looked down T the woman, her mouth parted in question, she was surprised to find the other sleeping. This was odd, for she didn't recall hearing the other woman voicing her tiredness. Without complaint, Kohaku simply continued stroking Drina's hair with one hand, a content smile on her face while she observed the woman snoozing so peacefully. It was adorable, really, and Kohaku had a horrifying realization. She was staying with a woman she was immensely attracted to. This could not end well. Even though Drina had kissed her back, Kohaku couldn't help but frown, her thoughts turning one good thing into several negative ones. Drina slept rather peacefully on top of Kohaku. She hadn't said she was tired, but the feeling of Kohaku's fingers brushing against her ears actually soothed her so much that she fell asleep without warning. Gently she gripped at Kohaku's shirt in her sleep, an even while shifting in her sleep she was still careful of Kohaku's wound. She made a light noise and a small smile crossed over her face. No one was really sure of what she was dreaming of but herself, but a pretty good guess would be that she was dreaming about the woman under her. The tightening grip on her clothes made Kohaku look down, breaking her rain of thought and hoping that Drina hadn't woken up so suddenly. It turned out to be her just shifting, so Kohaku moved her arms to cup around the other's body, hugging her securely in place so she didn't fall off of Kohaku, or the mattress--although the blond highly doubt she'd let that happen. A smile formed on her mouth again, light and assuring. Drina was dreaming peacefully, she had to be, or that smile wouldn't have been on her face just now. That smile made Kohaku's stomach churn, and her throat dry. It was really a lovely one, so innocent when asleep, so carefree. The young girl brushed her knuckles ever-so-gently across Drina's cheek, observing her with a look of adoration, loving the way someone could show such purity while sleeping, whether it was intensional or not. Drina's fingers tightened a little more as Kohaku hugged her close, but then they loosened up a bit as she relaxed against the woman once more. The gentle smile remained spread over her face, but the light touch on her face actually managed to bring her out of the light sleep. Slowly her eyes fluttered open and she looked up towards Kohaku; tilting her head upward slightly and not actually sitting up or anything. She still looked a bit dazed, but she smiled lightly once more. Kohaku wanted to mentally beat herself up. Here Drina was, sleeping so peacefully, and Kohaku with her dumbs blond del had to go an wake her up. Drina was smiling though, so it probably wasn't all that bad of an action. Kohaku embarrassingly smiled back, removing her hand from Drina's face as if she wasn't just oogling the other woman. "Hey there; sorry I woke you, I was trying to be quiet and careful," she apologized, thinking this was quite a day off for Drina. Getting woken up several times by a ditsy blond whenever she was trying to get a nap in. "Hey..." Drina mumbled back in a light voice with that light smile still there. She was still a bit out of it. If she hadn't been she'd have snapped out of it and stopped smiling by now. "It's okay. I wasn't sleeping too soundly. It wouldn't be that difficult to wake me up." She shifted slightly and nuzzled Kohaku's neck a moment before blinking slightly. "Hey...Why were you touching me?" She looked up at Kohaku once more, "Did you want something?" "E-eh..." Kohaku trembled slightly at Drina's nuzzling, fixing it cute and entrancing at the same time. Her hand came up to stroke the top of Drina's head once more, her body stuff at the affection she was recieving. With Drona's questions, Kohaku felt herself becoming trapped in some sort of imvestigation... Though Drina seemed pretty out of it, do maybe Kohaku could lie? The younger thought it best not to, especially since she liked Drina. "Um, no, I didn't need amything," she told the other, offering a smile. Drina snuggled into Kohaku slightly as she felt the woman's hand stroking at the top of her head once more. She made a small fox-like noise before she slowly lifted her head up from Kohaku so she could look down at her. "No...?" Her arms rested against the pillow on each side of Kohaku's head and looked down at the woman's face with that light smile and a very slight blush over her face. "Well...was there something you wanted?" Kohaku's hands flew up to Drina's waist to keep her steady as the other woman loomed over the blond, looking a bit flustered for someone who was groggy from sleep. The younger began to blush profoundly, her body becoming fidgety. "Want... Something..." She gasped when realization dawned upon her. Her gaze turned away, a soft pout upon her lips. "Oh! No, no! Drina, look, you can go back to sleep if you want, I won't disturb you again," she stuttered, becoming I characteristically embarrassed. Drina felt Kohaku's hands move against her waist and she smiled softly again, but after a moment she blinked slightly at what Kohaku said. Her ears slowly laid back against her head and she tilted it after. "You don't? You really look like you do. You've got a pout and everything." Carefully she leaned down and brushed her nose lightly against Kohaku's. "I'm asking you for a reason." Kohaku was really struggling with her inner feelings. In reality, she would of loved to have a chance like this with such a person; however, with Drina being so groggy and Kohaku not being in a official relationship with Drina, it made her feel like she was taking advantage of the woman, so, even though Drina's mouth so close to hers, and Kohaku's eyes fluttering at the mere thought of kissing the other, she turned her head away once again, feeling like she had to step away from the situation. "No... There isn't a reason, Drina," she murmured, hands sliding off Drina's waist to rest at her sides.